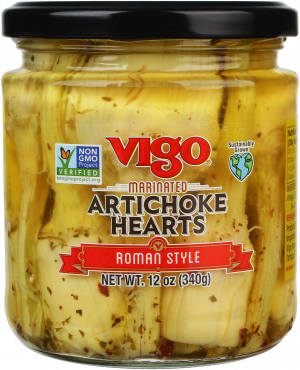 Vigo Imported Roman Style Artichoke Hearts are a true culinary delight. Picked when very young and tender, even the stems are delightful. They make an elegant addition to an antipasto tray of sliced meats and cheeses, green and black olives, roasted red peppers, pepperoncini, marinated mushrooms and eggplant caponata. Add to salads or pasta dishes or serve as an impressive side dish.